A choice of three different plastic badges made from white acrylic and with a pin as standard fixing. 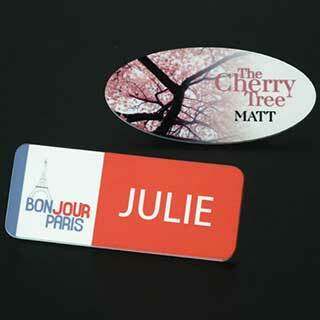 Available individually each name tag is printed with a name only as standard. For a one-off set up cost plastic badges can be personalised to your own design. Name badge printed in full colour. Magnet fixing also available at additional cost. Supplied in either oval or rectangle shapes Oval: 75mmx38mm, Rectangle: 75mmx32mm, Rectangle: 75mmx50mm. Supplied with pin as standard or to uprade your fixing to a magnet add £1.50 to the price. Black Text Only - Black text to your requirements One off setup £10. Full Colour - Printed in full colour with your own design One off setup £20. Minimum quantity 10 badges.